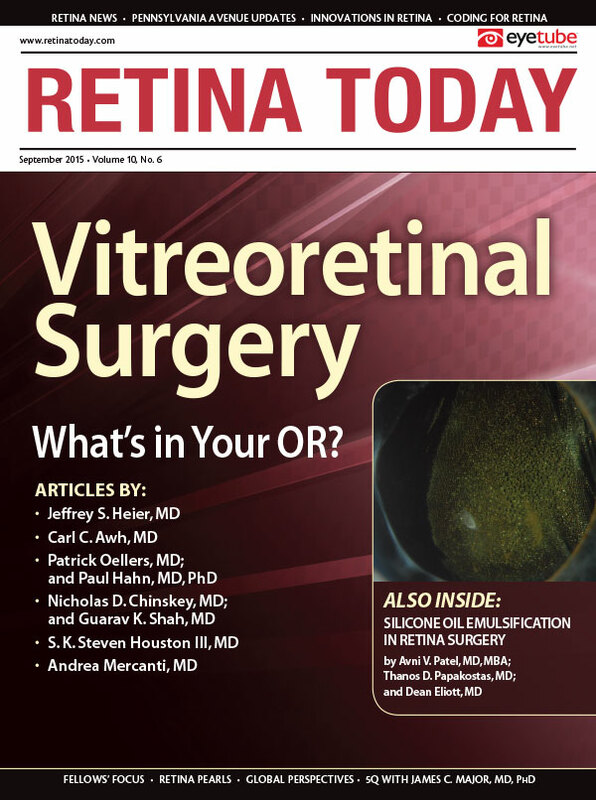 The following articles discuss the use of the two intravitreal corticosteroids approved for treatment of diabetic macular edema, as well as other indications. As part of this review of sustained-release steroid implants, I will discuss the 0.19-mg fluocinolone acetonide intravitreal implant (Iluvien, Alimera Sciences) in the setting of managing patients with diabetes. But first, let us acknowledge that the multiple comorbidities associated with diabetes often limit patients’ abilities to receive the optimal course of anti-VEGF therapy that adequately manages diabetic macular edema (DME). The 0.19-mg fluocinolone acetonide intravitreal implant was studied in two randomized, multicenter, double-masked, parallel-group, 36-month clinical trials (FAME A and FAME B) in patients with DME previously treated with laser.4 Entry criteria required at least one previous laser treatment and BCVA between 19 (20/50) and 68 (20/400) letters in the study eye as measured on the Early Treatment Diabetic Retinopathy Study chart. Patients with a history of uncontrolled intraocular pressure (IOP) elevation with steroid use that did not respond to topical therapy were excluded from participation, as were patients with glaucoma, ocular hypertension, IOP greater than 21 mm Hg, or concurrent therapy at screening with IOP-lowering agents in the study eye. Safety was studied over 36 months in the FAME trials. Adverse events (AEs) were consistent with other ocular corticosteroids and were manageable in nature.4 The most common AE was cataract, with 82% of patients in the fluocinolone acetonide treatment group reporting cataract compared with 50% in the control group. Cataract extraction was performed in 80% of these patients, compared with 27% of the control group. Increased IOP was reported in 20% of the fluocinolone acetonide patients compared with 4% in the control group; however, only 5% of patients experiencing increased IOP required incisional surgery. The study data indicated that none of the patients with prior steroid treatment required IOP-lowering eye surgery. This clinical response reflects the differences in the retinal microenvironment. When patients with DME do not respond adequately to selective anti-VEGF therapy, it may indicate that multiple cytokines, not strictly VEGF, are the primary disease mediators. Duration of DME appears to influence this increase in cytokine activity. The differential treatment effect seen in long-duration versus short-duration DME in FAME appears to be related to the continuous delivery of low-dose steroid. The 0.19-mg fluocinolone acetonide intravitreal implant received approval from the US Food and Drug Administration (FDA) in September 2014. The drug is indicated for patients who have been previously treated with a course of corticosteroids and who did not have a clinically significant rise in IOP. As a corticosteroid, fluocinolone acetonide may address multiple cytokines. The 0.19-mg fluocinolone acetonide intravitreal implant is a nonbioerodible implant made of polyimide, the same nonbioerodable material used in the haptics of many intraocular lenses. The cylindrical implant measures 3.5 mm × 0.37 mm and holds 190 μg of fluocinolone acetonide. A small 25-gauge needle places the device through the pars plana into the vitreous, creating a self-sealing wound and eliminating any need for tunneling. The implant delivers a continuous, low dosage (0.2 μg/day) over the course of 36 months. Fluocinolone acetonide levels peak 1 week after implantation and level off by the third month. Scott W. Cousins, MD, is the Robert Machemer, MD, Professor of Ophthalmology and Immunology, vice chair for research, and director of the Duke Center for Macular Diseases at Duke Eye Center at Duke University, Durham, N.C. Dr. Cousins may be reached at +1-919-684-3316. 2. Bressler SB, Qin H, Beck RW, et al; Diabetic Retinopathy Clinical Research Network. Factors associated with changes in visual acuity and central subfield thickness at 1 year after treatment for diabetic macular edema with ranibizumab. Arch Ophthalmol. 2012;130(9):1153-1161. 3. Wells JA, Glassman AR, Ayala AR, et al; Diabetic Retinopathy Clinical Research Network. Aflibercept, bevacizumab, or ranibizumab for diabetic macular edema. N Engl J Med. 2015;372(13):1193-1203. 4. Campochiaro PA, Brown DM, Pearson A, et al; FAME Study Group. Long-term benefit of sustained-delivery fluocinolone acetonide vitreous inserts for diabetic macular edema. Ophthalmology. 2011;118(4):626-635.e2. 5. Brown DM, Nguyen QD, Marcus DM, et al; RISE and RIDE Research Group. Long-term outcomes of ranibizumab therapy for diabetic macular edema: the 36-month results from two phase II trials. Ophthalmology. 2013;120(10):2013-2022. 6. Analysis of FAME data is on file at Alimera Sciences. 7. Canha-Vaz J, Ashton P, Iezzi R, et al; FAME Study Group. Sustained delivery fluocinolone acetonide vitreous implants: long-term benefit in patients with chronic diabetic macular edema. Ophthalmology. 2014;121(10):1892-1903.